I´m here today with my latest layout for the Scrap FX design team, it is also my entry for a couple of challenges (see below for links and how I was inspiered). A layout made with the Summer Fun Wordlet, the Blossom Stem & the Peacock Feather Stencil. The new chipboards from June had a travel theme, so you will find plenty there for documenting your summer. 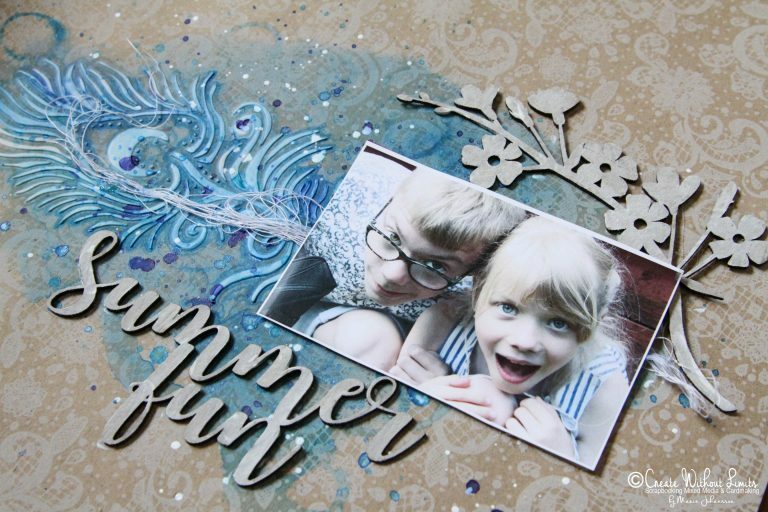 I must say that I am totally in love with the Peacock feather stencil. It´s just so nice & will surely be my to go stencil this upcoming months. Here I used it together with heavy white gesso to create a relief pattern on the base paper from Canvas Corp (Kraft & White Lace Paper). 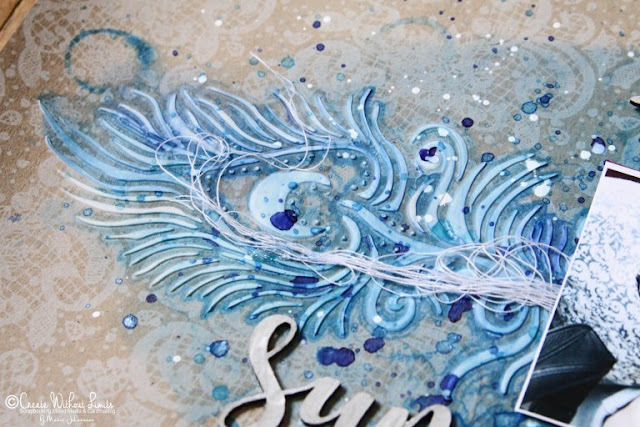 I also played around with blue Glimmer Mists from Tattered Angels to create watery feeling. I used the colors Blue Bubbles, Indigo Blue & Mountain Mist. The wordlet & flower where painted with a light coat of white gesso. 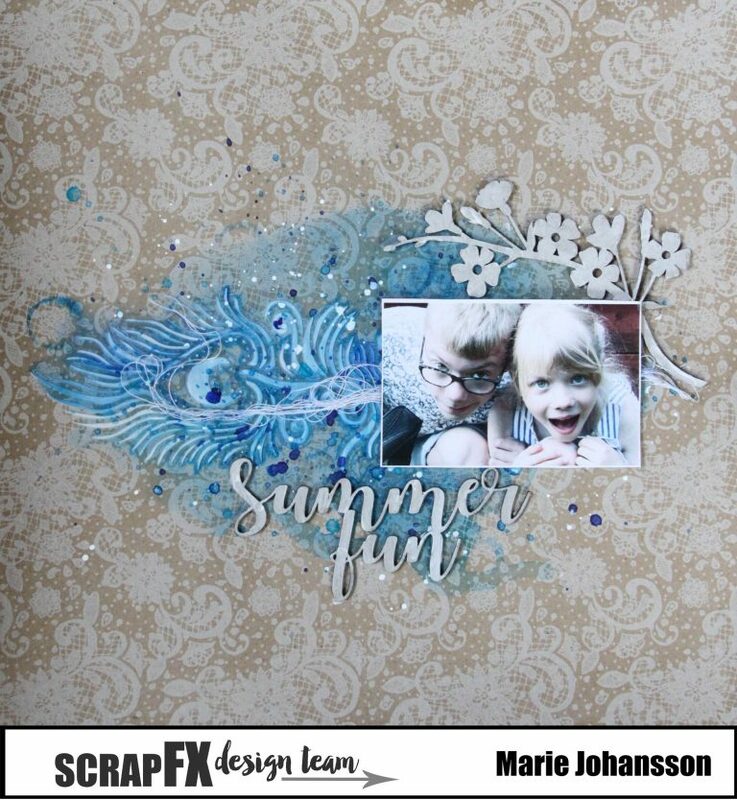 Since the base paper is kraft, the chipboard in it´s natural color would not stand out as much as I would have wanted them to. 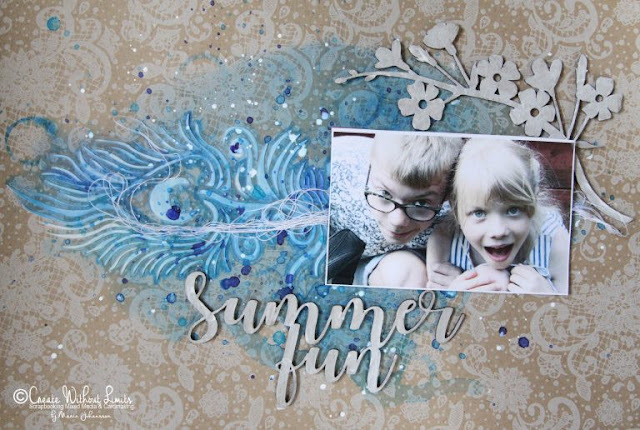 I also found this months challenge at Wyzwania nie-kartkowe and their lovely July Moodboard. The part of the moodboard with water colors, the part with the beach and the waterfalls inspiered me to use blues & water color techniques with my mists.